The Southern Rockies Wildlands Network Vision is a science-based plan that provides an ambitious but practical approach to protecting networks of land in the Southern Rockies to maintain and restore native biological diversity in this spectacular region. The culmination of this report was a joint effort between the Southern Rockies Ecosystem project, the Denver Zoo and the Wildlands Project. It emphasizes large core wild areas, functional connectivity across the landscape, and the vital role of keystone species (especially large carnivores) and processes. 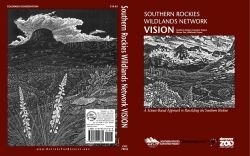 The Wildlands Network Vision is only the first step towards a working, living and changing plan for the Southern Rockies. As knowledge accumulates, methods improve or change, and conservation opportunities arise, successive iterations will chance the conservation plan, and therefore, the Network Design, of the Southern Rockies.